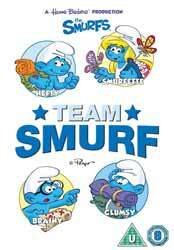 Team Smurf contains four episodes from the '80s Hanna-Barbera Productions animated TV show. This collection takes four of the popular characters and gives each their moment in the spotlight: Smurfette; Heft; Clumsy; and Brainy. Smurfette’s Sweet Tooth: Once a year, Greedy Smurf makes a special batch of Smurfberry candy - the Smurfiest candy in the whole world. Every Smurf receives one piece for each day of the year, but can Smurfette be tempted to have more and what will be the consequence if she does? The Pussywillow Pixies: Clumsy Smurf’s misadventures take him into the mysterious and dangerous land of Pussywillow Hollow. Papa Smurf leads a search party to rescue him from the evil Wartmongers. For small viewers this is an enjoyable collection that won't break the bank.